Enjoy $25 Off Your First Service Order When You Book Today! What Makes Pet Nanny Different? We offer a FREE estimate of all charges before your registration meeting, so you know EXACTLY how much you're investing in your pets' care and your peace of mind from the very start. Our pet first aid certified pet sitters leave detailed diaries at each visit and will also text or email you to keep you updated, so you can rest assured that only true pet care professionals are caring for your loved ones. YES! SEND ME MY COUPON! 🔒 100% secure: We never share your email. "I am a single “mom” and could not have made it through the last three years without everyone at Pet Nanny. The dog walkers were always so loving and knowledgeable. They always saw the best in Bodhi and recognized that his exuberance was always coming from a place of love. The office staff was always there to listen to my questions and concerns about Bodhi. They would make solid recommendations, but left his care choices in my hands. Pet Nanny is unmatched in service, knowledge, and reliability." "Pet Nanny has given me the chance to go on vacation and actually enjoy it. She has respected my worries that come with leaving your babies in the care of another. She did everything to ease my mind. She went overboard to make sure that I knew my babies are being taken care of, from sending text messages to pictures. I can now go on vacation knowing that she is there to take the very best care of Charlie, Spencer, TC and Timmy which gives me peace of mind to enjoy my trip." 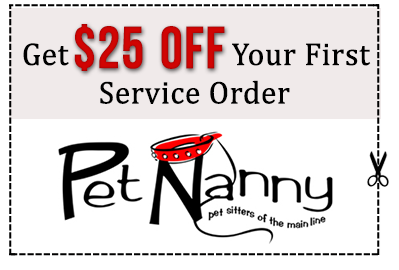 Enter your name and email address below to get your $25 coupon to Pet Nanny!